“Precision Agriculture” is a prominent buzzword in the industry today as just about every farming practice has some reference to precision. As can be seen at any current agriculture or farm show, technology has become commonplace in all aspects of farming. Today’s growers are adopting technology at an ever increasing rate because it is providing them with tangible results in the form of greater efficiency, higher yields, and substantive economic returns. Another driving force towards technology is a term that you routinely hear is “Sustainability”. Sustainability practices are being integrated into policies and business plans across government and suppliers of consumer products. Many companies like Walmart and Costco are demanding that every aspect of their supply chain meet their sustainability goals. What’s that got to do with your operation? It means that growers are going to demand that your aircraft have comparable precision application capabilities to that as a ground rig. Applications must be made with exactly the right amount of material in the right location and have all the data logging capabilities to feed into a grower’s crop management system. Prescription application is becoming the norm. The tangible results that the growers are seeing demonstrated with ground rigs is increased and more consistent yields, and in many cases, reduced material costs. The efficient use of ag chemicals no matter the application method, is essential in meeting both the customer and the public’s sustainability expectations. In the early 1990’s when GPS guidance systems were still in their infancy, Kawak Aviation Technologies recognized the potential to combine the benefits of hydraulics with GPS control. Kawak Aviation has designed and supplied FAA approved hydraulic systems for 23 years supported by a background in the industrial hydraulic business for over 35 years. After receiving FAA approval in 2002 for an engine driven hydraulic system on the AT 802, Kawak along with Air Repair, Satloc, Jensen Aircraft Services, and a group of progressive minded California and Mississippi aerial applicators, combined the hydraulic driven chemical system with liquid flow control, GPS, and prescription mapping. 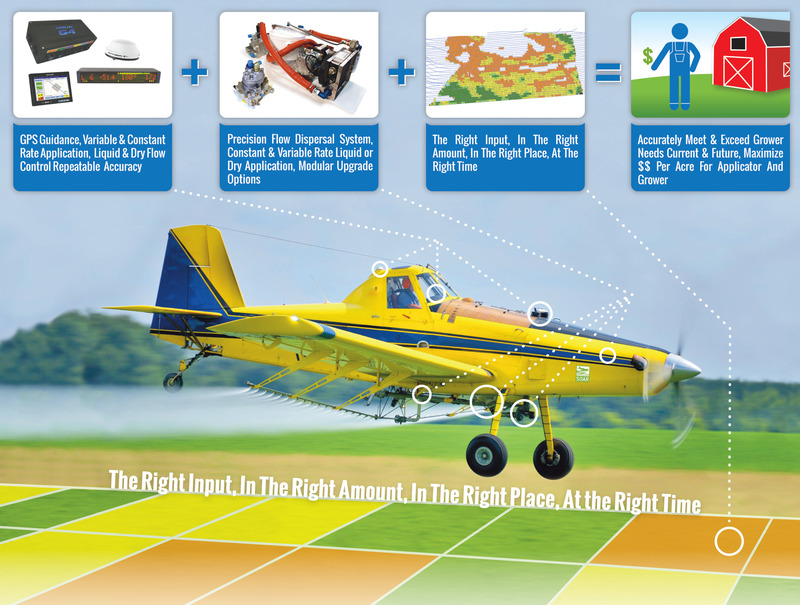 The system ultimately was tested on a USDA Air Tractor 402 and was shown to provide excellent results with regards to accuracy and speed of rate changes utilizing a prescription map. In 2004, Air Repair and Kawak began a collaborative effort to develop a system that would give applicators all of the benefits of hydraulic control at a lower price point by utilizing an electro/hydraulic power unit. The system was designed primarily for dry flow control operation however the intention was to have a single power unit that could power not only the gate box, but boom valve, hopper door, flap system or any combination as well. A modular unit with the ability to have additional functions layered on depending on applicator preference. The system has demonstrated 10 years of successful field proven service and during that time Air Repair and Kawak have continued to add capabilities as new technology has become available. The latest gate box control features a new Parker touch screen display with advanced software developed by Air Repair for the Parker control. The software was designed for total compatibility with the Satloc G4 system in order to provide both constant and variable rate functions for dry flow control. The control provides more than just simple repeatability of the gate box opening. A popular feature is the one touch gate cleanout. This allows momentary opening of the gate in order to clear a clump of material or in the case of liquid, drop as little as 5 gallons and immediately return to the set gate opening. The control operates in conjunction with the gate actuating cylinder that contains an integral position feedback sensor or what has been generically referred to a as a “Smart Cylinder”. Kawak designed a smart cylinder retrofit for the 10” gate in 2003 to replace the low resolution encoder that was standard on the original 10” Transland gate. Kawak/ARI also offers the only smart cylinder system for 5” gates which utilizes the same hardware and control as its 10” counterpart. Historically, the relationship between Kawak and Air Repair has been Kawak handling the engineering, FAA certification, and manufacturing of the hydraulic system components. Air Repair has contributed design and installation details along with software and control development. Additionally, Air Repair has been the primary sales outlet and provided installation services. Gate systems will now also be available through Kawak and its distributors which will provide customers with a comprehensive network for new systems, parts, installations, and technical support. Air Repair and Kawak’s goal is to provide applicators with an STC’d gate box system that offers the most features, best technology, best support, and be the best investment you can make on your aircraft.